In a medium bowl, mix together the eggs, milk, garlic, salt and pepper. Heat oil in a large heavy skillet over medium-high heat. Place the panko crumbs in a shallow bowl. Rinse pork chops with water, then dip in the egg mixture. Coat with panko crumbs, dip in the egg mixture again, then coat with another layer of panko crumbs. Lay coated chops on a plate until the rest are finished. If you have time, let them set for about 10 minutes, and the coating will set very well. If you wish to freeze the chops, now is the time. When the oil is very hot, place pork chops into the pan, and fry for about 5 minutes on each side, until golden brown. This was fantastic...just like at a Japanese restaurant, it was crunchy and tender!! Yum! Now, if I could only make nigiri! Thanks! This recipe was enjoyed by the entire family. Served with a tangy tonkatsu sauce & rice, there were no leftovers. 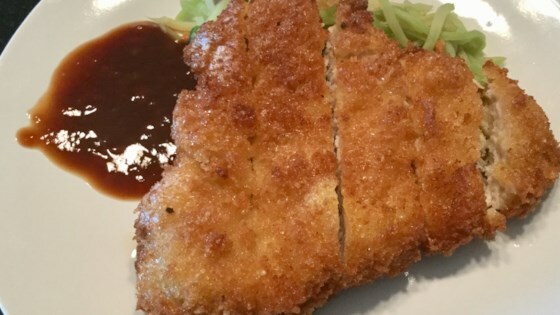 Looking fwd to making them again, but i'll get more panko next time.